Contentful-Wizard is a library created for authors and content editors, allowing them to see which page element contains what entry and content type. 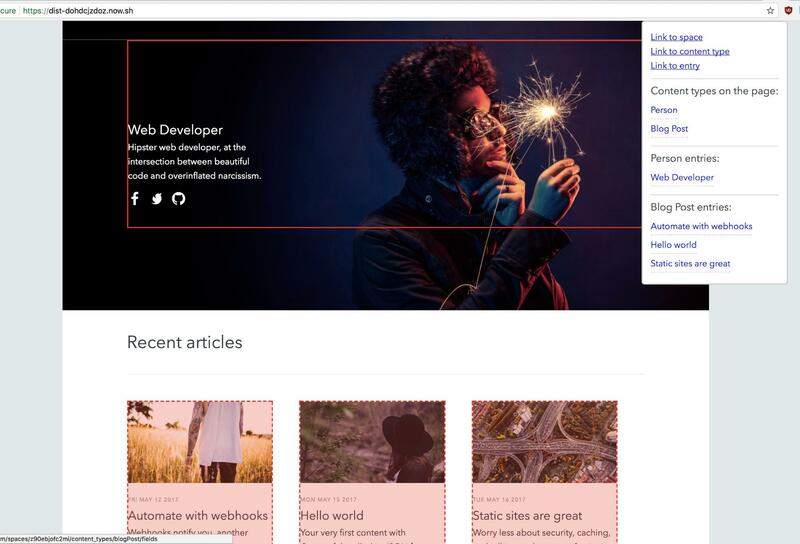 Built by frontend developer Seva Zaikov, Contentful-Wizard offers a clever way to highlight parts of your application and then show the corresponding content types and entries within an overlay. The library also creates links to the respective entries in the Contentful web app. This way you can discover the visual relationship between entries and elements by hovering over them. In the following screenshot, you can see that Contentful-Wizard makes it easy to understand that the text describing the hipster web developer is of the content type Person. If would like to edit this descriptive text, we follow the Link to the entry link. Here's a live demo of Contentful-Wizard. Note that the links to the corresponding content types within the demo app won't work for you since you don't have admin access to that space. To use this library in your application, include the UMD build. You will then have a global object that you can call to instantiate a Wizard. In turn, the wizard will iterate over all DOM elements, picking those with data-ctfl-entry and data-ctfl-asset data attributes, highlight the borders, and add tooltips on hover with links and info about the elements on the page. Note that the values for data-ctfl-entry, data-ctf-content-type , data-ctfl-asset, spaceId, and key are unique to your project. Let's look at the content of the tooltip once again. As you can see below, all entities have human-readable titles. But where do they come from? If you don't provide any fields, or if the fields don't exist or don't have a value—the library will try to get title field first, and then name. However, it is still pretty magical, so it is better to provide your own field names. There is no "smart" guessing strategy, like trying to list all fields with a string value and get one with a short enough value, since that could lead to inconsistency. What else can we do with the Contentful-Wizard? You will find a thorough explanation of these features, and how to customize them, in the Contentful-Wizard README.md. Contentful-Wizard is an example of how you can use Contentful’s extendable architecture to implement custom components. 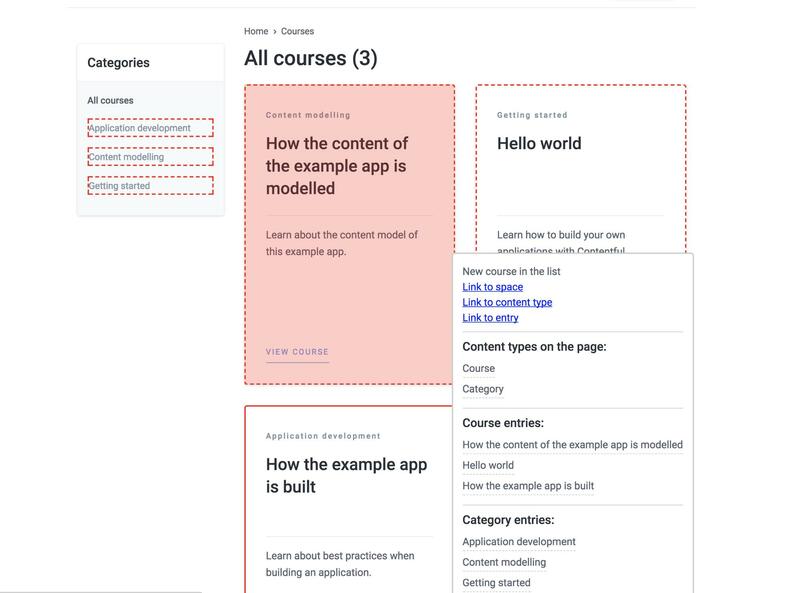 Even though this is an early release, it’s easy to see how visualizing content and content type can be useful for getting an overview of all elements and their content. Have a look at the roadmap to see what feature lie ahead. To get started with Contentful, create a free Contentful account right here. Would you like to learn how to build a Contentful-integrated app using your favorite language? Then check out our new Contentful courses. You can follow Seva on Twitter, GitHub, and on his blog.